Whew! It's been a busy, busy Memorial Day Weekend! On Saturday, the family and I headed down to Fayette County, WV where we visited the Whipple Company Store, the ghost town of Thurmond, Hawks Nest State Park, The Mystery Hole, and the Glen Ferris Inn. Sunday, we attended the annual Vandalia Festival at the capital and explored the state museum. Monday, we took it fairly easy and took Luke to see the Angry Birds movie. And, on Tuesday, we watched my nephew walk across the stage and receive his high school diploma. So yeah, I'm ready for June....and a little rest and relaxation! For the first blog of the new month, I wanted to share with you a little about our trip, starting with the always awesome Whipple Company Store. Our original itinerary only included the Mystery Hole and Hawks Nest, but since we were so close to Whipple, we decided we had to make a stop there, too. I am SO glad we did. The travel gods were really smiling down on us that day! But before I get into that, a little about Whipple....The Whipple Company Store near Oak Hill was built around 1890 and used as a company store until the Whipple Mine shut down in the 1950s. After that, it was privately owned and operated as a general store for many, many years. Now, it is owned by a wonderful couple who work diligently to preserve not only the unique structure itself, but the fascinating history and the forgotten stories, both good and bad. And of course, the building is believed to be haunted! One of the most haunted areas of the building is said to be the third floor ballroom. The ballroom was added for Lucy Collins, the wife of the mine owner, Justus Collins. It was a place where she could stay and entertain while accompanying her husband on trips to this particular mine town. After the Collins' home in Charleston was completed in 1907, Lucy's entertaining at the company store dwindled. Interestingly, in the 1950s when the first private owner took over, she completely boarded up that part of the building for fear of the spirits that resided there. HPIR was fortunate enough to have given the opportunity to privately investigate this location in 2012. If your own private investigation isn't feasible, you can still experience the darker history of Whipple; each fall, there are haunted history tours available for the public. 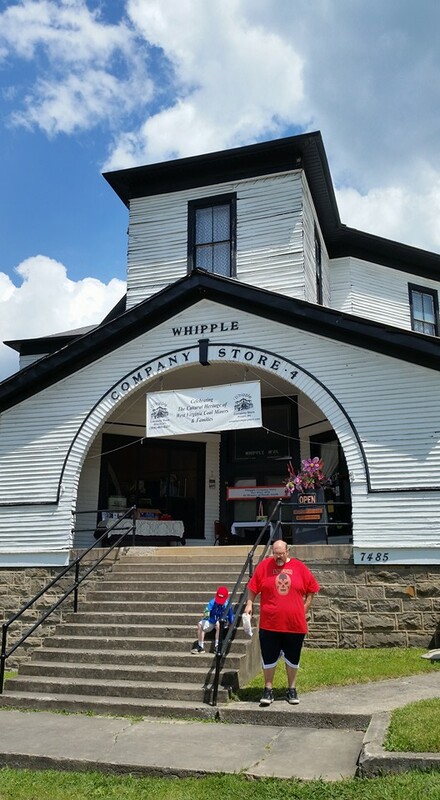 You can read more about the ghosts of Whipple in my original blog, Coal Camp History Comes to Life at the Whipple Company Store. Anyway, back to our trip. So we arrive at Whipple, and are pleasantly surprised to see that we arrived on a special day. There was an antique car show going on that day! Not only did we get to take a look at some really awesome vintage wheels, but Luke got to actively participate as a Youth Judge! He received an official hat, t-shirt, and lanyard. 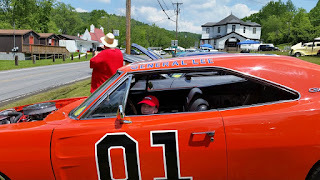 I have no idea why, but he picked the General Lee as his favorite car, lol. 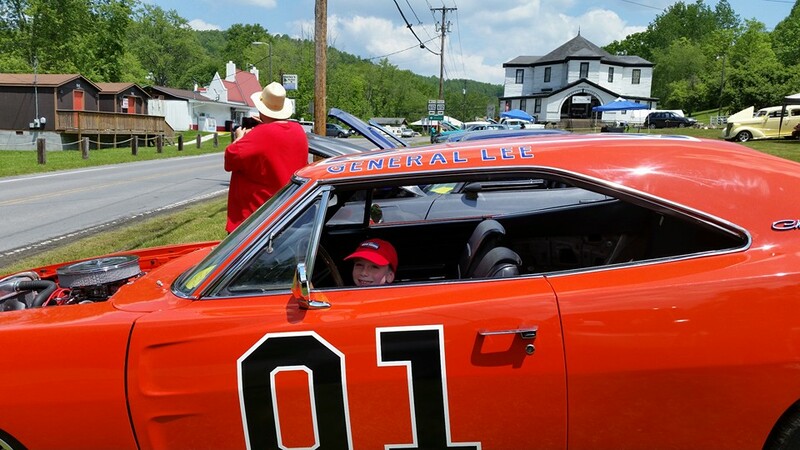 The owner of the car was really cool---he let Luke sit inside and get his picture taken. When it was time for our tour to start, once again I was pleasantly surprised! Since the car show was going on that day, the owners of the store were offering complimentary tours! This was a somewhat more abbreviated tour than the normal, intended to be an introduction to the store to spark interest in it. However, it was still an excellent tour, full of information and even some hands-on activities for the kids. One interesting tidbit that I learned was that obviously poorly mannered children were not welcome during the reign of the coal company store. If a poorly mannered child were to approach the porch, the guards on duty did not say a word or touch the child. Instead, they would simply knock into the mother, causing her to fall down the narrow and cleverly designed front steps. Luke really took this info to heart; he was well-behaved as usual, but I did remind him that if he acted up, someone might push Mommy down the stairs, and he seemed to take that seriously, lol. On a funner note, he got to operate the old elevator, explore how a scrip register and scrip worked, and sit in an old phone booth. I really enjoyed getting a refresher on some of the information I already knew about the store, learning a few more interesting tidbits, and just BEING there. Growing up in West Virginia and coming from a long family history of coal mining, the idea of the company store fascinates me. Joy and Chuck, the owners, have done such a wonderful job in keeping the history of this unique treasure alive. The Whipple Company store truly is one of a kind. It's like a time capsule and it is something that I would encourage EVERYONE to visit. You WILL learn something. You WILL be entertained. You WILL be touched by the overwhelming emotion that permeates throughout the walls of the Whipple Company Store. You might even be creeped out! During the autumn, special haunted history tours are available! Whether you're interested in coal mining history, women's history, West Virginia history, paranormal history, or history in general, Whipple is a treasure trove. Make it a must-see stop on your next trip through southern West Virginia. It's not a long drive from Charleston, and its a very short drive from Beckley. It's also located nearby a ton of other great tourist spots. If you can't make it to southern West Virginia any time soon, you can still support this wonderful location. You can pick up a copy of one of their awesome books (I got Volume I), make a donation through their website, or follow them on Facebook and spread the word! Let friends and family know about this little gem of Appalachia.